Here’s another fantastic testimonial from a 2012 client … I hope you find it inspiring as you make your resolutions and 2013 wellness goals! “After receiving negative blood work, I consulted with Barbara to find solutions to lose weight, reduce my cholesterol intake and triglycerides. After 9 months of coaching, I lost 40 pounds to reach my goal weight of 195 lbs., reduced my cholesterol by 20 points, and halved my triglycerides — a major WOW! This morning, the first day of 2013, I received a wonderful message from a health coaching client. Now THIS is the way a health coach wants to start a new year! Everyone has goals and today is the day we all talk about them. No matter how slow or fast your journey towards your goals progresses, it’s a wonderful thing to move forward. What are your goals and how do you plan to make them reality in 2013? Today is the first day of school in my neighborhood. Not only did I get caught behind those big yellow buses as I went to the pool, but there was actually excitement at the bus stops! I saw all these kids with big grins on their faces. And what fun it has been to see all the photos from my Facebook friends and their kids. Now I just need to see some photos of my grandkids on their first days!! Speaking of photos … here’s one from my archives. That’s me on the lower right! 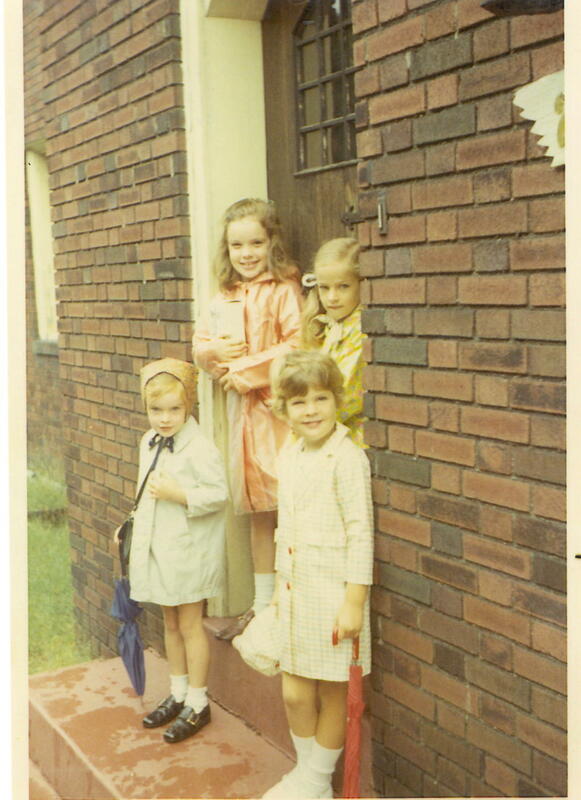 Not sure exactly what year, but I do know it was our first day of school. Pretty cute, huh? Are you ready to make a fresh start just like all the school kids? I’ve just launched a new and completely F*R*E*E program. It’s a 10 days of emails from me to Jump Start Your Health. I encourage you to sign up TODAY and get started on a new adventure. This is a great way to find out how having a Health Coach can change your life! Many years ago I discovered that exercise was a terrific way to cope with stress. I know – so did a lot of us! I also love the endorphin rush of a good workout – it helps me stave off my natural depressive tendencies. In fact, about 10 years ago I decided that I needed to “write myself a prescription” for exercise and really get serious. Now my planned exercise gets entered in my calendar and treated like a meeting. I OWE it to myself to show up! Over the last year or so, it’s been hard for me to get those exercise sessions on the calendar regularly. The primary reason has been some chronic pain issues I’ve experienced. Plus, once I got out of the habit it was a challenge to “ramp it up” again. This year, my spring resolution is to get my exercise back to its previous levels in my life. I OWE it to myself not to skip – I need the stress relief – I need the endorphin rush – I need the fun! So, instead of just going back to my old standard exercise choices, I’m trying something new. It’s fun to learn something new, and to laugh a little at myself for being klutzy. It’s got to be good for my brain to learn new ways to make my body move. And I wanted to try something that wasn’t going to be as hard on my body. So the decision is — I’m starting water exercise classes! I’ve been to two classes now, and it’s a great choice for me. Not the hardest workout I’ve ever had, but I leave feeling like the 60 minutes invested has made me feel energized and upbeat. I can’t say whether I’ll notice big physical changes or not, but I know my heart gets pumping during class.